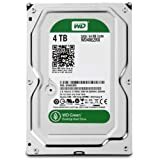 Amazon has the WD green 4TB desktop hard drive: 3.5-inch, sata 6 Gb/s, IntelliPower, 64MB cache WD40EZRX for $124 with free shipping. Sells for $135+ Highest Price. Deals for $108 Lowest Price. Normally $121+. 4 TB capacity holds up to 800,000 digital photos, 1,000,000 MP3 files, and 300 hours of HD video.